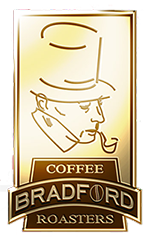 From 1997-2001 Kirk Bedrossian founder of Bradford Coffee, traveled through the world learning the coffee business through his father. Spending time in Costa Rica, Indonesia, Guatemala, Vietnam, Colombia, and 20 other coffee growing regions. It was at this moment that he decided to return to Los Angeles and start Bradford Coffee Roasters. First small batch roaster to develop hand crafted coffees. First 5lb vertical form fill seal machine. Added a second 4 bag machine to maintain customer demand. Added additional automated packaging lines and 2 additional roller mills. Developed a high quality instant coffee line, with special zip loc see through packaging. All our coffees are roasted and packed immediately utilizing valve packaging. We never pre-blend our coffees before roast. Every coffee has it’s optimal roasting method, and we blend after roast all our coffees blends.